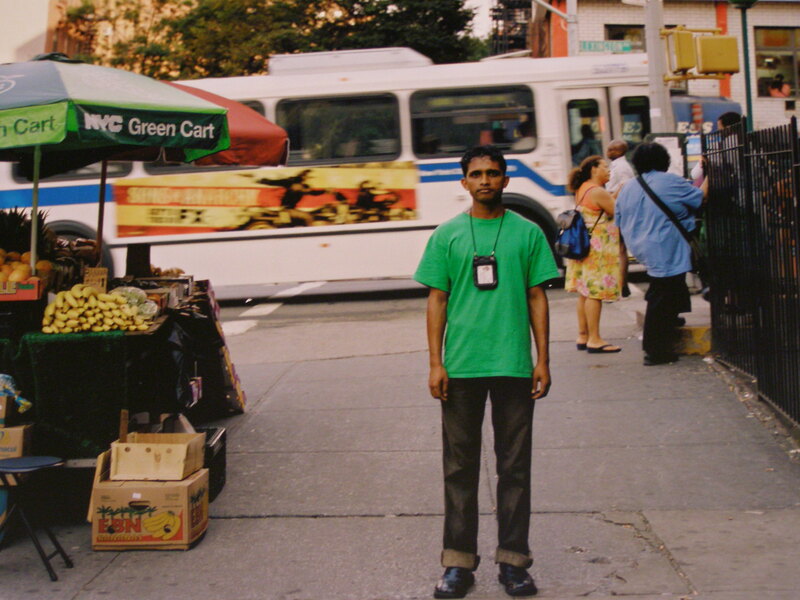 Photo of Bangladeshi Green Cart vendor in Brooklyn by photographer Thomas Holton. New York City Green Cart vendors, the men and woman who have ventured into some of the city’s poorest neighborhoods to sell fresh fruit and vegetables, are the subject of a significant photography exhibition at the Museum of the City of New York. The exhibition — called “Moveable Feast: Fresh Produce and the NYC Green Cart Program” — chronicles the lives of the cart vendors and their customers. Thomas Holton, meanwhile, documents in intimate detail the lives of two Bangladeshi vendors who man a cart in Brooklyn. Each photographer examines different dimensions of the Green Cart program, an initiative launched in 2008 to bring more fruits and vegetables to neighborhoods dominated by fast-food chains. Will Steacy documents the neighborhoods, while Shen Wei captures still life photos of unusual fruit sold at the carts. LaToya Ruby Frazier focuses on black-and-white street shots of the vendors. The Green Cart program was developed to help address the issue of obesity, diabetes and other illnesses prevalent in communities with limited access to fresh produce. Unfortunately the program has had only moderate success. Less than half of the 1,000 permits allotted for Green Carts have been issued. As of March 2011, the Department of Health and Mental Hygiene, which runs the program, had issued 450 permits, according a report released by Manhattan Borough President Scott Stringer. The “Moveable Feast” exhibition will run through July 10. For a related New York Bounty post, click here. Entry filed under: Farmers Market, Food Dilemmas, Local Food Production. Tags: Gabriele Stabile, LaToya Ruby Frazier, Moveable Feast: Fresh Produce and the NYC Green Cart Program, Museum of the City of New York, New York City Green Cart program, NYC Department of Health and Mental Hygiene, Scott Stringer, Shen Wei, Thomas Holton, Will Steacy. Gerard — You’ve just given me a great idea for a blog post. I’m not sure how much vendors make, but it’s probably not much. I’ll investigate and report back! Gerard — I thought of an additional point with regard to vendor earnings. Most NYC cart vendors get their produce at wholesale prices from the Hunts Point Terminal Market. They buy bananas, for example, for 45 cents a pound. I would imagine that the earnings/wages they make depends on how much they mark up the produce they buy. They probably don’t make much money, but it will likely vary by vendor and their own individual business models/practices.